Tumor necrosis factor-α (TNFα), also known as cachectin, plays roles in antitumor activity, immune modulation, inflammation, anorexia, cachexia, septic shock, viral replication and hematopoiesis. It is primarily produced by macrophages in response to immunological challenges such as bacteria (lipopolysaccharides), viruses, parasites, mitogens, and other cytokines. TNFα is cytotoxic for many transformed cells (its namesake activity) but in normal diploid cells, it can stimulate proliferation (fibroblasts), differentiation (myeloid cells) or activation (neutrophils). 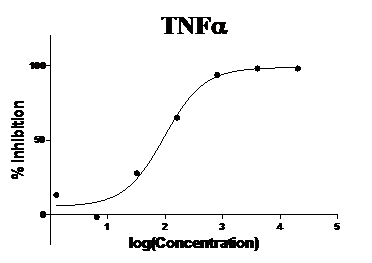 TNFα also shows antiviral effects against both DNA and RNA viruses and it induces production of several other cytokines. TNFα and the related molecule TNFβ (LT-α) share close structural homology with 28% amino acid sequence identity and both activate the same TNF receptors, TNFR1 and TNFR2. Species:This Gensunbio TNFα is produced in Pichia Pastoris . Storage:Lyophilized after dialysis against Phosphate buffer saline,pH7.4. Stable up to 1 year at -20°C from date of receipt.Please avoid freeze-thaw cycles. 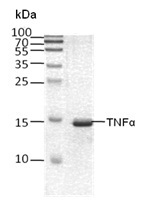 Activity: Measured in a cytotoxicity assay using L-929 mouse fibrosarcoma cells in the presence of the metabolic inhibitor actinomycin D. The IC50 for this effect is typically 0.02-0.1ng/mL, corresponding to a specific activity of 5x106-1x107 units/mg. Endotoxin：Please contact us for more information.